Ca. 121 B.C. beleaguered King Limhi dispatched an expedition from the city of Nephi to find the land of Zarahemla and request aid Mosiah 21:25. The 43 explorers never found Zarahemla. They found the ruins of the Jaredite nation Mosiah 8:8-9, Ether 1:2 in the land the Nephites would later call Cumorah. As the diligent exploring party returned to Nephi bearing Jaredite artifacts, they thought they had found Zarahemla and their people, including King Limhi, also believed they had found the sad remains of the once-great Nephite nation. LDS Mesoamericanists generally agree that the land of Nephi was in highland Guatemala with Kaminaljuyu a leading candidate for the city of Nephi. They further agree that the land of Cumorah was in the Tuxtla Mountains of southern Veracruz with Cerro Vigia a leading candidate for Hill Ramah - Cumorah. We have established that a reasonable size for the local land of Zarahemla would be on the order of 2,000 - 3,500 square kilometers. See the blog article Test #7 Land Areas. A land with dimensions 50 X 50 kilometers would have a surface area of 2,500 square kilometers. We have established that a reasonable distance from the city of Nephi to the local land of Zarahemla would be on the order of 320 air kilometers. See the blog articles Test #6 Relative Distances and Land Southward Travel Times. If you set an origin point 320 air kilometers distant from a 50 X 50 kilometer area the vectors from origin will diverge by slightly more than 9 degrees of arc. 1. The arc between the vectors Nephi/Cumorah (the route Limhi's explorers actually traveled) and Nephi/Zarahemla (the route they should have traveled) will exceed 10 degrees. Vectors closer than 10 degrees of arc imply the Limhi expedition would have found Zarahemla. 2. The arc between the vectors Nephi/Cumorah and Nephi/Zarahemla will not exceed 45 degrees. Vectors more than 45 degrees divergent depreciate the Zeniff colony records. Zeniff himself traveled the Nephi/Zarahemla route 4 times with large groups of people and he wrote a detailed history Mosiah 9:1 so Limhi's explorers had a general idea of the direction they should travel. 3. The distance Nephi/local land of Zarahemla will be about 320 air kilometers. 4. The distance Nephi/land of Cumorah will not be less than 160 air kilometers (320/2). 5. The distance Nephi/ land of Cumorah will not exceed 640 air kilometers (320 X 2). The distance Nephi/land of Cumorah will not be greater than 2X the distance Nephi/local land of Zarahemla. An analogue: If a person sets out to travel from Cedar City, Utah to Lehi, Utah (320 air kilometers), by the time they arrive in Idaho Falls, Idaho (648 air kilometers), the diligent traveler will realize they have gone too far. 6. The land of Cumorah will be lower in elevation than the land of Nephi since one always went up from Zarahemla to Nephi Mosiah 9:3. 7. The land of Cumorah will be west of a large north-flowing river Limhi's explorers could have mistaken for the Sidon since the local land of Zarahemla was west of Sidon Alma 6:7. 8. The local land of Zarahemla will be in the coastal plain downstream from the mountains and the fall line since that is where Limhi's explorers were when they found what they thought was Zarahemla. 9. The lay of the land and direction of flow of the rivers should make it obvious where the Limhi expedition went wrong such that they ended up in Cumorah rather than Zarahemla. In our correlation, Kaminaljuyu = City of Nephi, Nueva Esperanza - Calatraba = City of Zarahemla, the Pilapa = eastern border of the land of Cumorah, and Boca del Cerro = southern border of the local land of Zarahemla. The arc between our Nephi/Cumorah and Nephi/Zarahemla vectors varies from a minimum of 26 degrees to a maximum of 32 degrees. Criteria 1 & 2 satisfied. The distance from Kaminaljuyu to Boca del Cerro is 325 air kilometers. Criterion 3 satisfied. 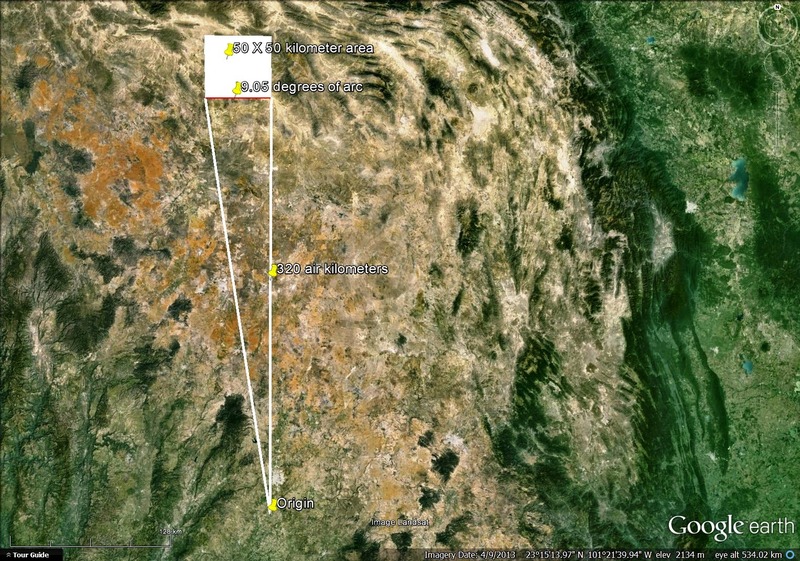 The distance from Kaminaljuyu to the Pilapa River is 608 air kilometers. Criterion 4 satisfied. 325 X 2 = 650 air kilometers. Criterion 5 satisfied. The Limhi explorers could have mistaken the large, north-flowing Coatzacoalcos for the Sidon. 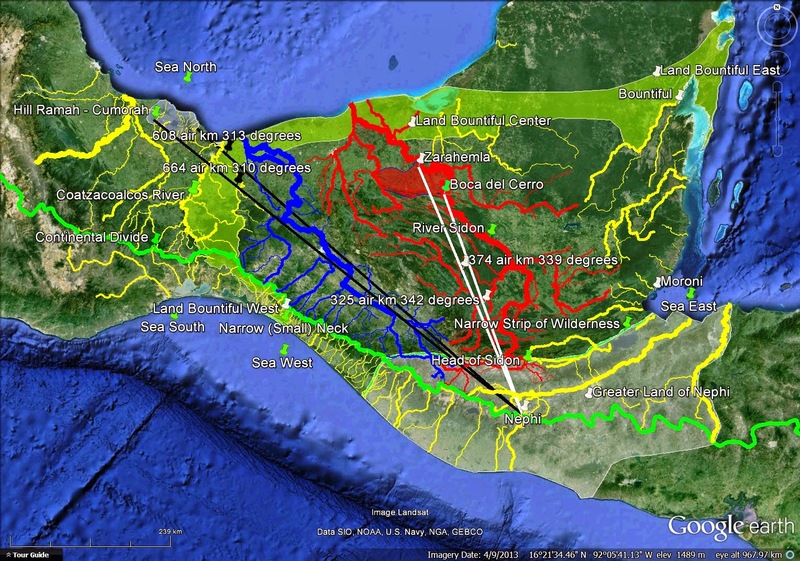 Our proposed land of Cumorah lies to the west of the Coatzacoalcos. 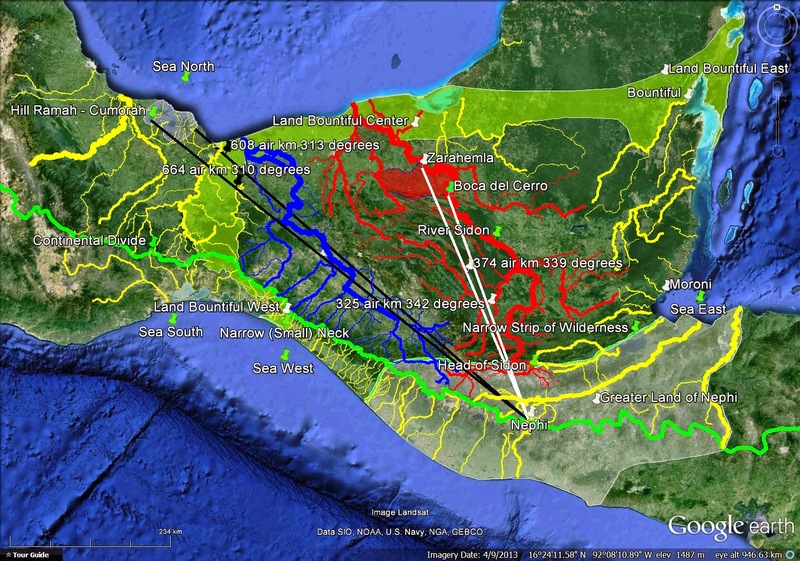 The green line on the map below is the 100 meter fall line along the Mesoamerican Gulf of Mexico coast. This is the line where the southern highlands end and the northern coastal plain begins. Our proposed local land of Zarahemla, shown in red, lies almost entirely within the coastal plain. Criterion 8 satisfied. The black vectors approximate the journey of Limhi's explorers from Nephi to the land of Cumorah. 28% of the distance the 43 expedition members traveled was in the coastal plain downstream from the fall line. 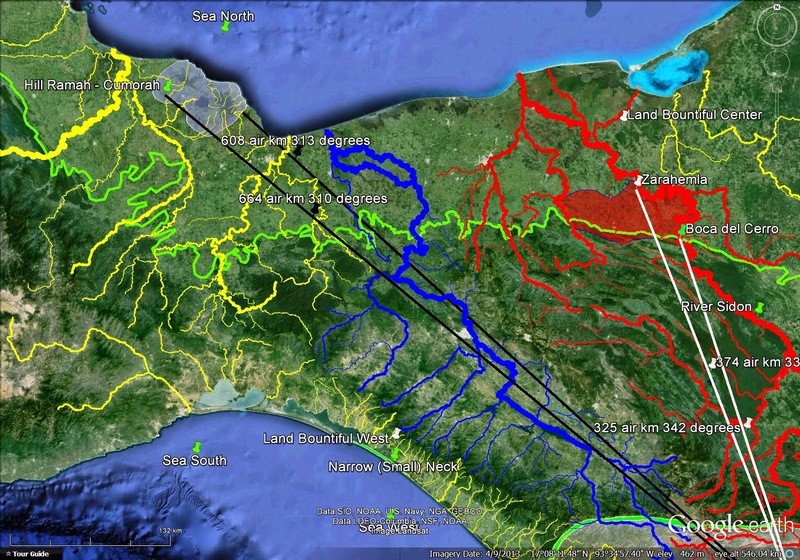 On the map below the Chixoy - Usumacinta system is in red, the Mezcalapa - Grijalva system is in blue and all other river systems are in yellow. The black vectors represent the approximate route the Limhi expedition followed from Nephi to Cumorah. The white vectors represent the approximate route they should have followed to reach Zarahemla (the actual route went through the Salama Valley around the point we call head of Sidon). The explorers traveled through five major river basins, three of which are shown on the map. If our correlation is correct, the Nephites in the local land of Nephi were very familiar with the Motagua River. Our hill north of Shilom where King Noah built one of his towers Mosiah 11:13 lies across the Motagua from the local lands of Nephi and Shilom. The Nephites probably knew the Motagua flows eastward to empty into what they called the east sea. They probably also knew that the Sidon flows northwesterly. 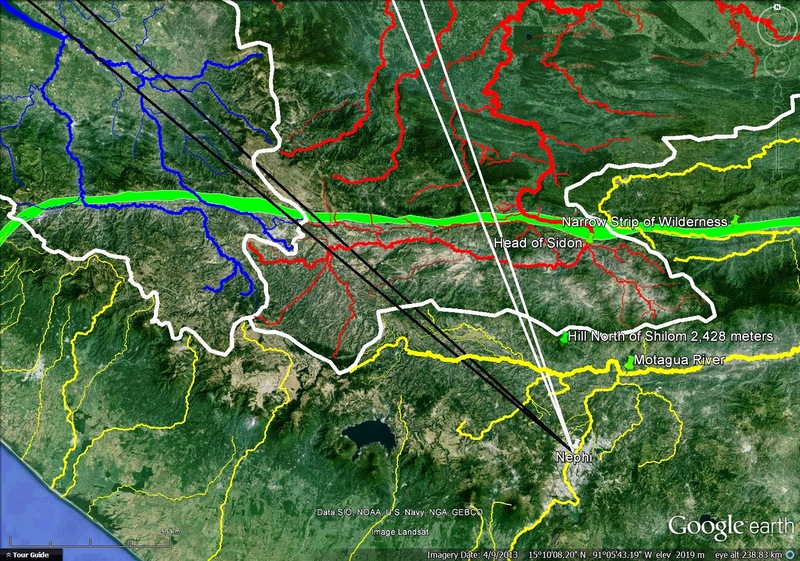 Crossing the Usumacinta basin, they likely noted the eastward flow of the rivers and thought they were still on a tributary of the Motagua. Pushing northward and westward they found rivers in the Grijalva basin flowing northwesterly. Thinking they had found the Sidon drainage, they followed the Grijalva to the coastal plain without success before moving westward to the Coatzacoalcos and beyond. They successfully crossed the Motagua as they should have done. They erred is traveling NW across the Motagua when they should have gone counter-intuitively NE around the head of Sidon. Criterion 9 satisfied. Our correlation comfortably fits all 9 textual criteria. Any viable correlation should show a similarly high degree of fit to the text.